याला कितीदा तरंगत ठेवू ? आहे का, आणखी एखादा दरवाजा ? Gibt es ein zweites Tor? 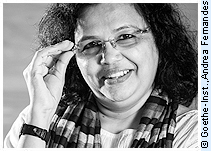 Pradnya Daya Pawar born in 1966 is a leading Dalit–feminist Marathi poet, columnist and writer. Her work is political and deals squarely with caste oppression and patriarchal exploitation in Indian society. Her books on poetry includeAntastha, Utkat Jivghenya Dhagiwar, Aarpaar Layit Pranantikand Drushyancha Dhobal Samudra. She was honoured with the Birsa Munda Sanman Puraskar in 2009 and the Bodhivardhan Puraskar in 2010. Her poetry is a statement of her comprehensive experience. She comes from a family that performed tamasha – an open, no-bar, no-taboo folk form. Her poetry, seeped in this tradition, defies even the framework of traditional defiance. In her very first collection entitled Antastha she tried to bring Dalit poetry out of its caste-centric limitations. Her poetry is personal and hence political. It is that of a Dalit Panther, a she-panther for whom the jungle with its wild abandon is also poetry. She teaches in the Marathi department of Dnyansadhana College, Thane.